This spring I had the pleasure of attending several Nance Klehm workshops hosted by The Ranch at The Huntington Library and Gardens. 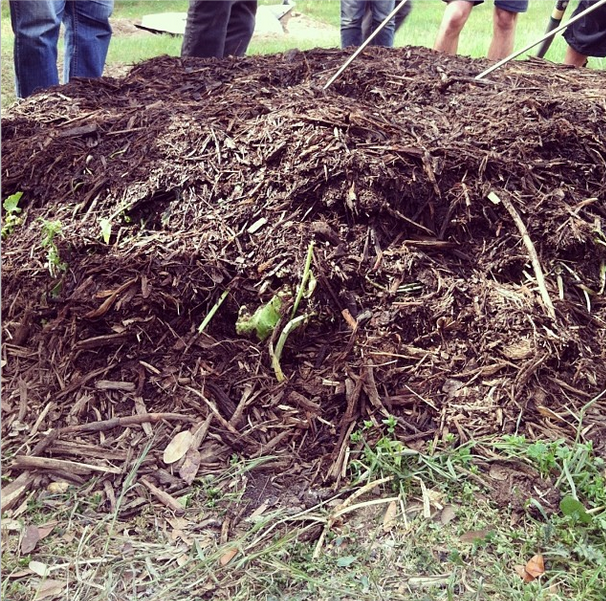 The first series was on two different methods of composting and the second series was on bioremediation. 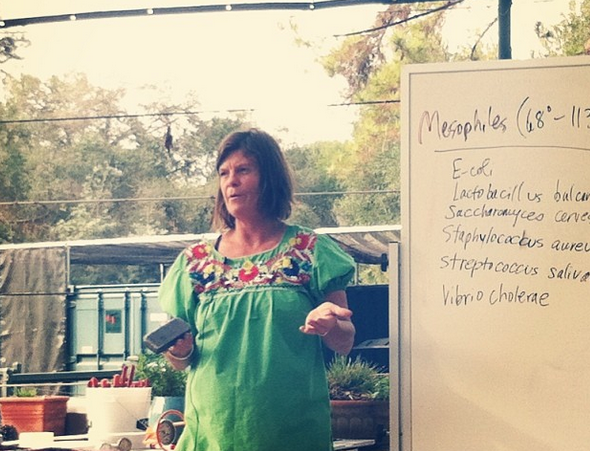 I'll try my best at covering some of the basics she went over when discussing and involving us in creating mesophilic and thermophilic compost piles. Fellow class member checking the temp a week after. 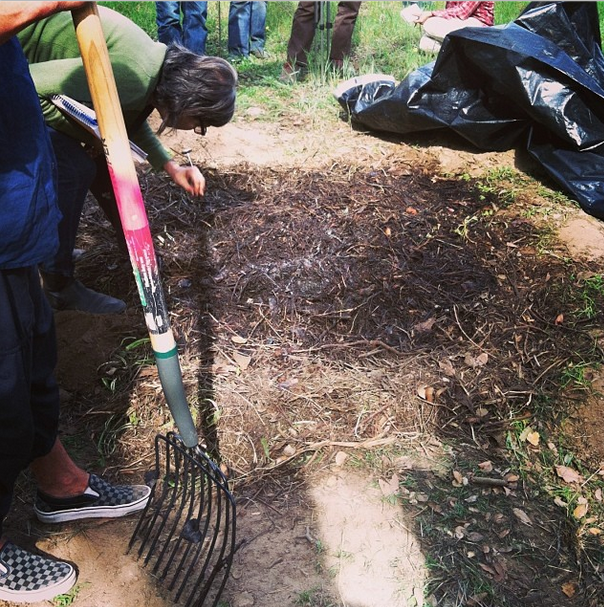 The mesophilic compost approach, pictured above, is basically a low-maintenance in-ground composting method. We used this approach in our garden and its worked out the best for us, just need to make some minor adjustments by digging a little deeper and wider. You can always tend to it more to get it hotter sooner, but the idea is for it to also be low-maintenance. This in-ground pile's temperature will range from 68-113 F.
Now, time for thermophilic compost building with Nance Klehm. We started by layering carbon and nitrogen in an eye-pleasing circular design, see below. Like a compost cake! This is a more common composting method. Layering carbon (browns) and nitrogen (greens) and watering whilst doing so. The thermophilic compost cake we created the previous week, pictured below, was at about 120 F degrees and sections went anaerobic due to too much greens in ratio to carbon, will be aided by adding in more carbon. 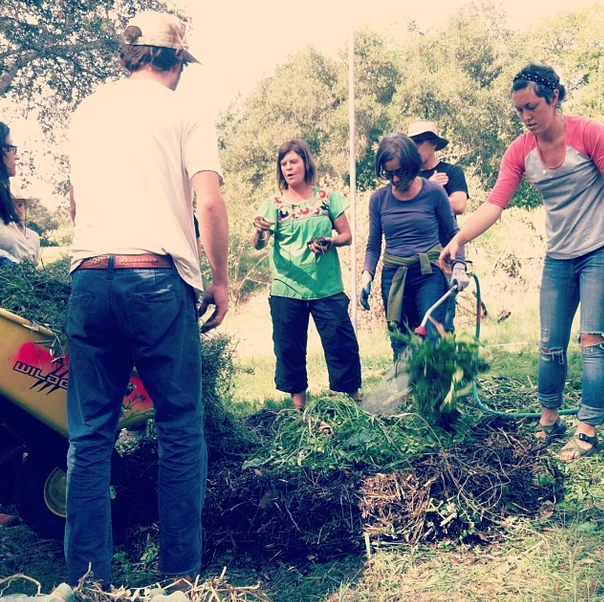 The mesophilic compost pile (in ground) we created smelled better, see second photo above. I think mesophilic was around 110-113 F degrees outside to center. How hot is too hot before you should start worrying about sterile compost? Nance says around 145 F.
Ask any and all composting questions below and I'll try my best at answering.